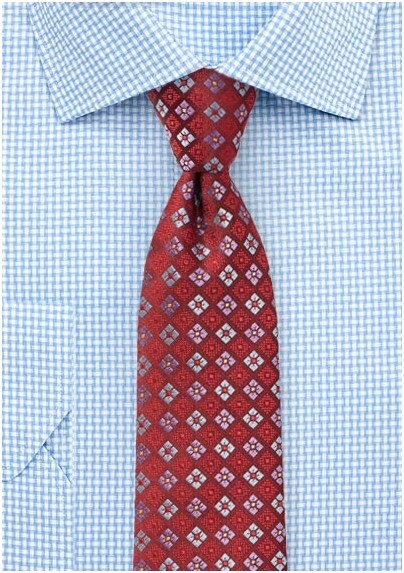 This new checkered patterned tie features an unusual micro check made up from woven florals. The colors of cherry red on the background is paired with a complimenting palette of lavender and sky blue. A fantastic tie to add to shirts in lavender, light blue, white, gray, and black. This new design by PUCCINI is also available in a palette of blues as well as navy with pinks. 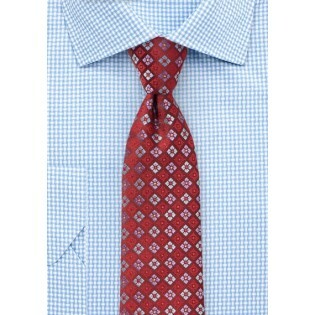 Made from a high quality microfiber fabric by one of our favorite tie brands.